This baby blanket is a gift for a newborn princes. How do you make the heart shape pattern?? Where can I find the patter in English? Thanks! Shell: In st indicated, work (2 dc, ch 1, 2 dc). Long double crochet (long dc): Insert hook in st indicated and draw up lp to height of working row; yo and draw through 2 lps on hook. To change colors, work until 2 loops of last stitch remain on hook. With new color, yarn over and draw through 2 loops on hook. Cut old color. Row 3: Ch 1, sc in first dc, ch 1, sk next dc, working over next ch-2 sp, sk next sk dc on 2nd row below, long dc (see Special Stitches) in next 2 sk dc; *ch 2, on working row, sk next 2 dc, sc in next ch-1 sp, ch 2, sk next 2 dc, working over next ch-2 sp, sk next 2 sk dc on 2nd row below, long dc in next 2 sk dc; rep from * 22 times; ch 1, on working row, sk next dc, sc in 3rd ch of turning ch-3, turn. Row 4: Ch 3, dc in next ch-1 sp and in next 2 dc; *2 dc in next ch-2 sp; dc in next sc, 2 dc in next ch-2 sp; dc in next 2 dc; rep from * 22 times; dc in next ch-1 sp and in next sc, changing to new scrap color in last dc, turn. Row 5: Ch 3, dc in first dc, ch 2, sk next 5 dc; *in next dc work shell; ch 2, sk next 6 dc; rep from * 21 times; in next dc work shell; ch 2, sk next 5 dc, 2 dc in 3rd ch of turning ch-3, changing to A in last dc, turn. Rep rows 3–5 until piece measures approximately 62 inches, ending with a row 4. Cut 25-inch strands of A. For each knot of fringe, hold 6 strands tog and fold in half. Draw folded end through first st on 1 short end of afghan. Draw ends through fold and tighten knot. Tie knots evenly spaced across each short end of afghan. Trim ends even. Click on link under the post by Dessy. When U get to the site right click your mouse on any open space & it should translate page for you. 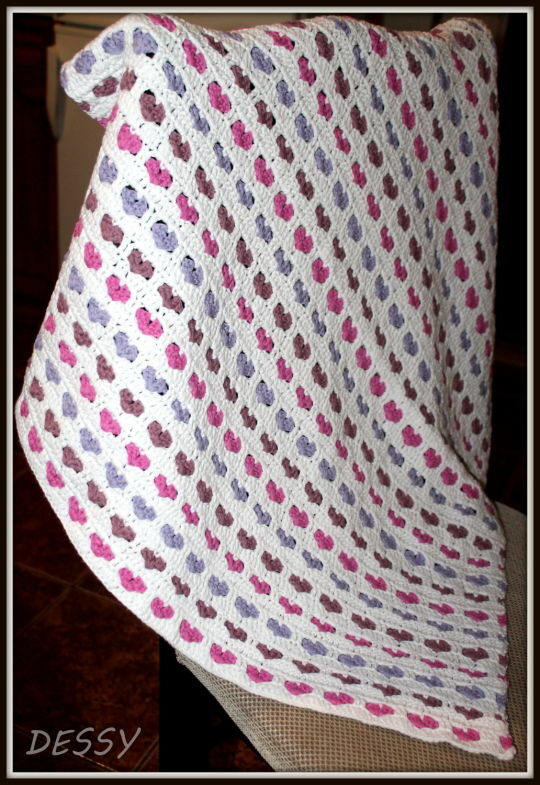 Then go down under picture where it says: (EDIT: I have received several comments from English readers concerning this pattern. I did not create this pattern myself. It is an existing English pattern designed by Mary Ann Frits and you can find the original instructions here.) Click on the word here & it will take you to the English version of pattern. Hope this helps.. I tried to set up link to it here but couldn’t.. Thank you very much! I have the pattern now. :).